Tatooine Ghhhauahhh why am I reading this . . . When I initially sat down and began to read this, I was a little excited. I’d been avoiding the book for years because it had a NJO cover and I didn’t think it was canon. Later, when I found out when it was set, I knew I had to read it to establish its canoncity or non-canoncity, as the case might be. So I was kind of excited to sit down and read a new Star Wars novel, and one about Han and Leia, too! Han is a pretty difficult character to write; most authors cope with him by having him repeat his lines from the movie and slouch. I myself don’t write about Han because I can’t get a good handle on him. Troy Denning did a tolerable job, and the book was fairly readable. The chapters were short enough to make your eyes cross, but on the whole, I don’t have complaints about the writing. No, what earned this book one miserable star from me was the fact that the plot took my willful suspension of disbelief and beat it with a rubber hose until it’d had enough. Plot: Han and Leia go to Tatooine to recover a valuable painting before the Empire gets it. (There is a vague notion that if the Empire does get it, it will be very bad for everyone involved, but Denning is not terribly good at developing an antagonist. The bad guys never appear in this book in more than name only — which I was fine with, because Pellaeon is another difficult character to get, and I’d rather him never show up in person than be mutilated by someone who doesn’t know what he’s doing.) And so far this is all great. They meet Kitster at the auction house; he’s put up a holo of Anakin Skywalker winning the Boonta for sale. This is also really cool — I love it when Star Wars characters encounter the unknown past! But Denning spoiled an incredible opportunity by somehow, inexplicably, having everyone on Tatooine know that Anakin Skywalker became Darth Vader. Now, if this were the case, well, in the words of Goldentusk, it’s strange that Owen never thought to change Luke’s last name in the event that someone might connect the dots! Very, very few people knew that Anakin Skywalker became Darth Vader, and Denning spoiled a fantastic opportunity of playing with people’s minds by having the entire backwater planet inexplicably know this. It ended up ruining most of the rest of the stuff in the book; what that didn’t ruin was ruined by one unlikely occurrence after another, all facilitated by an obvious refusal to do any research whatsoever. Anchorhead is very, very far away from Mos Epsa, and yet everyone in Mos Epsa is on intimate terms with everything that goes on there. Watto didn’t even know where the Lars had moved to, for goodness’ sake. Then, in a twinkling fairy godmother spell of fate, Gavin Darklighters’ parents have moved into the old Lars homestead and Mrs. Darklighter has found Shmi’s journal! GASP! Leia reads her grandmother’s journal, which just so happens to include footage of her father’s epic podrace — because 15 minutes of that crap in the movie wasn’t enough, and I really wanted to read a three page blow-by-blow description of it again. And magically they go to Obi-Wan’s house and find a magic box that gets forgotten about by the end of the book. Also, in spite of the fact that Tusken Raiders are wildly nomadic and Anakin obliterated the entire tribe that killed his mother, Kitster is being held in the SAME ENCAMPMENT and Leia is able to enter the VERY SAME torture tent her grandmother died in!! Will wonders never cease? Really, the entire book limps along in this fashion, flogging the reader over the head with more obvious coincidences than can reasonably be expected in a book. You know, when I was about 12 years old, I wrote a little piece of fanfiction about Luke encountering a bunch of stuff to do with his nine-year-old father. It read like a hokey bit of crap, and yet now I’m disappointed I didn’t forward it to Lucas, because apparently it would’ve gotten published and honestly read better than this nonsensical assembly of way too many pages in large text with huge margins and double the necessary chapters. To top it all off, the end simply peters out, and somehow they’re making an escape successfully and it doesn’t really matter if the Imperials are about to blow them up or not because Han is okay with having kids now, and that really was the important part. On the whole, don’t bother reading this. It tried very, very hard, and there could have been some interesting stuff involved, but Denning spoiled it by having no sense of the universe about which he was writing. Because of all the unlikely coincidences heaped up together combined with facts that couldn’t possibly be general knowledge, the canonicity of this book is extremely dubious, and I still don’t know what to make of it. I’m sorry. I did try. 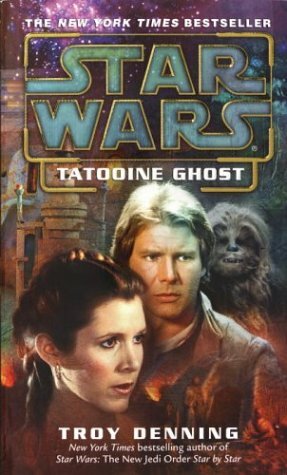 This entry was posted on 3 July 2011 at 12:00 PM and is filed under Reviews, Spotlight with tags books, expanded universe, star wars canon. You can follow any responses to this entry through the RSS 2.0 feed. You can leave a response, or trackback from your own site.